1 Comment on "Wolverine #10 Open Thread"
I felt like this book was basically a set up for issue #11. Canon Foot was indeed lame, but he was used as a building block for something much greater. Perhaps this isn’t a excuse but I think he was meant to be killed off by Wolverine. 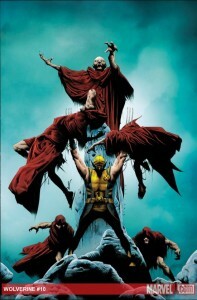 I think the Red Hand wants Logan to butcher them all, because it will probably complete some kind of occult ritual that will ultimately screw over Logan somehow. Either way I think this book did a good job of telling us more about the villains which was necessary.